Corona, CA Violin Lessons Near Me | Fun Classes. Top Tutors. 100% guarantee. Expert Violin teachers near you. Affordable and fun classes that students actually want to attend. Book now. Check out some of our most popular teachers near Corona, CA including Riverside, Oceanside, Rancho Cucamonga, Fontana and Redlands. Hi there! My name is Chris and I've been playing music my entire life and I believe that with the right attitude and environment anyone can achieve musical greatness! I was born into a musical family and have studied classical piano since I was 4 years old! I am very well versed in music theory and proper technique, with an emphasis on avoiding player's injuries, as well as a great knowledge of classical Pieces for any skill level. As a young teenager I grew rebellious and learned how to play the electric guitar and have since sought teachers outside my family to learn modern styles and 5 other instruments!! I have also worked toward a music degree and have made music the center of my life. ve as these things are important regardless of your favorite music. Lessons are held with a fun and relaxed attitude. Learning music should always be enjoyable and a good attitude and love for music is cultured and encouraged. Lessons are structured just like a practice session should be. We will begin with a warm-up exercise designed to acquaint you with the proper technique to meet your personal musical goals. the next activities are highly personalized, but is usually something like reading music or a music theory game. These activities are things that are good for you but may not be your favorite part of learning music. They will, however, go a long way toward your better understanding of how your favorite music is structured. Examples could be learning about 12 bar blues, common strum patterns (for guitar), scales, sight-reading, or music analysis. By structuring our lessons the same as how you will practice, and by keeping good notes, it will be easy for you to take on practice at home and achieve all of your musical goals! Students should have their own guitar/piano/keyboard etc. Guitar/violin students should also have a music stand and tuner to keep at home. I will bring picks, spare tuner, music, and handouts. I primarily specialize in classical piano in styles such as Muzio Clementi and Frederic Chopin. I also play Bach and various Spanish classical guitar pieces. I have also extensively studied electric guitar in Blues such ZZ Top, Metal such as Metallica, and rock such as Led Zeppelin. I have also studied Irish and Celtic folk music for instruments such as Mandolin and Violin. My daughter absolutely loved it!! My son had a great experience and learned a lot in the first lesson. 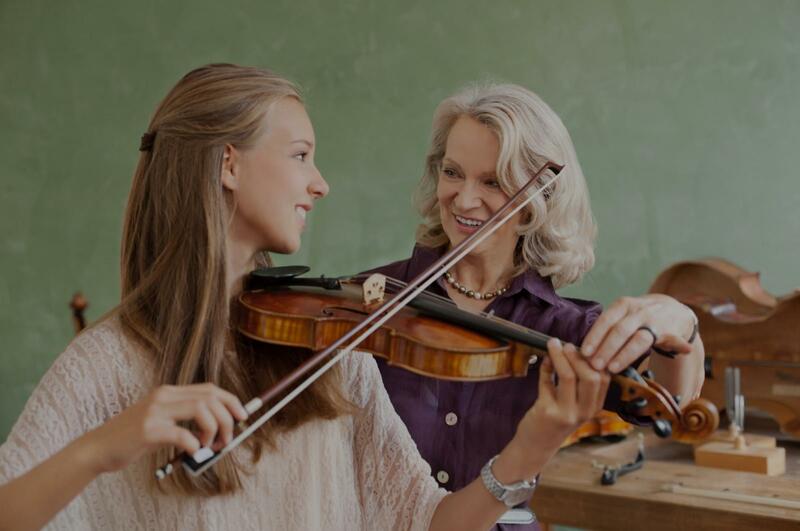 Suzuki Violin program for students of all ages, experienced teaching violin to young children, opportunities for duet work for older students, piano accompaniment during lessons. Small violin available for young student trial lesson. My name is Mary and I have been teaching piano, voice, violin, and music theory for more than 35 years. I have an undergraduate degree in music, a masters degree in special education, and a doctoral degree in education. I am a professional musical director and have directed over 50 shows. I am also a music therapist and I have special skills in teaching instruments to children with special needs. I love working with kids! Musical theater is my specialty and if you are a singer I can help you belt your way to Broadway! I teach lessons in my home studio, at your home, and online. Every 3 months I host a student recital at my home studio. Students may choose to play a solo, duet, or be in a small group number with other students. I offer a fun, no-stress approach to learning music! For piano I specialize in working with young children- Music for Little Mozarts (ages 4-6), Prep Course (ages 5-7) and Older beginners (ages 8 and up). I also teach intermediate to early advanced level classical piano. Violin- I teach Suzuki Method (beginners through Book 7) to students age 5 and up. I also teach intermediate and early advanced classical styles. Voice- I offer Music Theater Vocal training, audition prep, acting in song, monologue coaching, preparation for high school and college auditions, contemporary and pop singing styles. Music Theory-Beginners through AP Music Theory class level, keyboard skills are also taught in conjunction with music theory instruction. first piano class, a "10"
Mary is a great instructor. Super patient and mellow, she understands how to bring kids out of their shell and help to create a good experience with performing. We are super happy with Mary. She is patient, understanding, and calming, putting my kid at ease in this new situation. She understands learning challenges and can easily adapt her instruction to fit the child's needs. I would recommend her to anyone! Students can start with me as a beginner or as an advanced student looking to learn new practice skills, new technique, skills, and bow strokes. Students work on scales, exercises for tone and coordination, vibrato, solos, sight reading, rhythm, audition music, and orchestral music. They get 2-6 opportunities to perform per year. I can teach a variety of music styles such as jazz, classical, romantic period music, 20th Century music, contemporary music, bluegrass, Celtic, Irish Fiddle, Scottish Fiddle, movie music, and popular music. I recommend many youth orchestras in the area that I encourage my students to join. Some of my students go to Italy in the summer with their orchestra. I can help you work on audition music for All Southern Youth Orchestra and All State Youth Orchestras and other Youth Orchestras. I go at the student's pace and also start out many beginners that have reached Suzuki Book 10 level. Jill has been teaching music privately for over 15 years. Some of her students have won concerto competitions and music awards, music scholarships and participate in local youth orchestras. She teaches violin, viola, and piano. on violin and jazz theory at Saddleback College. Jill had private violin lessons with 12 different teachers and has been playing the violin for almost 25 years. Jill has performed at the Segerstrom Concert Hall, Walt Disney concert Hall and Soka Performing Arts Center. Jill also attended the Montecito Summer Music Festival and Soka's Chamber Arts Festival to study and perform string quartets and piano quintets. Jill also is classically trained and performed professionally with the Dana Point Symphony, Montage Civic Orchestra, Brentwood/Westwood Symphony, Laguna Niguel Presbyterian Church orchestra, Vanguard Symphony Orchestra and Symphony Irvine. She also worked as a violinist for Irvine Valley College. She performs classical, pop music, and jazz and plays reggae music, top hits, movie music, and rock for professional violin events as a solist and with a violin and cello duo. Jill is patient and has a variety of students and able to adjust to each student's personality and needs. Jill has performed as a solo violinist at the Orange County Fair in 2007 and 2008 with a Bluegrass band and was a concerto competition winner in 2004 performing Haydn's Violin Concerto No. 2 with the South Orange County Chamber Orchestra as a soloist. Piano students learn from the Faber & Faber books, classical piano collection books, Bastien method books, Snell, Hanon exercises, and scale books by Bastien. Violin and viola students use Suzuki method books along with reading music and playing all standard violin and viola literature outside of the Suzuki method. Students learn vibrato and shifting to other positions and learn from etude exercise books, scale studies using Carl Flesch books or Essentials for Strings books, and Sassmanshaus Early Start on violin, a fun method book for young violin students. Etude books used: Wolfahrt, Kreutzer, Rode, Dont, Fiorillo, Gavines, and exercises from Schradiek and Sevcik. Composers and literature taught: concertos by Vivaldi, Bach, Mozart, Haydn, Hoffmeister, Stamitz, Mendelssohn, Wieniawski, and Kabalevsky to name a few. Bach Sonatas and Partitas and Bach cello suites for viola. Sonatas by Beethoven, LeClair, Vivaldi, Frank, Brahms, and more! Jill can also teach pop, fiddle, and has studied jazz improv and jazz theory. Private violin students can participate in the Certificate of Merit program testing in Fountain Valley and Huntington Beach. Students also learn to read music (Sight reading) and learn rhythm. 2 optional recitals per year for students. Jill can help students with orchestra auditions for local youth orchestras. She has helped students get into All State and All Southern Youth Orchestras, join youth orchestras that summer tour Europe, helped students with Certificate of Merit, and auditions and acceptance into the Orange County High School of the Arts and college auditions. She has taught at various music studios and coached music at high schools and middle schools in orange county. Large, open living room space with an 88 key weighted upright keyboard. Seating for parents in couches and chairs. Foot stool for shorter piano students. Music stand light. Music Stand for Violin & Viola Students. My 6 year-old daughter had her first piano lesson with Jill and loved it! She is so kind and made the learning experience really fun. Very knowledgeable and patience, we are lucky to have picked her. Experienced teacher of 30 years available for eager students of all experience levels and ages. I structure my lessons so students learn what they want to learn, while also building a strong foundation of classical skills. I specialize in classical music and provide multiple playing opportunities for my students throughout the year. My musical education began while sitting on my mother's lap as she taught piano lessons. I began studying cello with a member of the Kansas City Philharmonic at age 9, and at age ten, I followed in my mother's footsteps to play the flute. I played all three instruments, (piano, cello and flute) until high school when it was became clear to me that I wanted to be an orchestra teacher. With this dream in mind, I began playing the violin as well. I graduated from Drake University with a Bachelor's in Music Education in 1989 and again in 1999 with a Master's degree. el Europe with "America's Youth in Concert" and I was a three time All-Stater. While attending Drake University, I played in the Drake University Orchestra and the Des Moines Symphony, and I was the winner of the Young Artist Competition awarding me the honor as featured soloist with the Drake Symphony Orchestra. In 1993 I began playing with the Encore String Trio. This trio plays on a regular basis for weddings and receptions. I currently play cello in the Encore String Trio, and viola in the Long Beach Community Orchestra. My teaching experience includes nearly 30 years of private teaching. I've had the pleasure of teaching all areas of music; elementary general music, band, choir and orchestra. During my 20 years of teaching orchestra in the public schools, I implemented many innovative opportunities for my students such as children's concert which drew more than 700 people in attendance, strolling strings, cello choir and a viola choir, all of which proved to be very motivational for the students. My goal of teaching is to make music fun for all. I believe music should be fun. I provide you with several playing opportunities throughout the year, ranging from solo to group playing. I provide large group playing opportunities at Christmas and at the recitals. Every group playing opportunity is accompanied with food and games for all. This studio is FUN! Whether you are studying for recitals, competitions, a music career or just for fun, you can expect equal attention to technique and musicianship in your lessons. Lessons will be tailored to each students needs which may include flash cards, supplemental materials, ear training, sight reading, technical studies, scales, and solo work. You are never to old to learn to play an instrument. Over half of my students are adult beginners. Because of this, I provide group playing opportunities and I organize a solo ensemble contest for my students. This gives opportunities to the adult beginners that they missed out on as a child. You will have a lesson by yourself, monthly mini recitals in my studio, and you will have the opportunity to play orchestra music as a group all right here in my studio. You are guaranteed to learn how to play your instrument, have fun and gain great friendships here in this studio. I'm looking forward to introducing you to our studio family. The teachers studio is in a large room with multiple windows for natural light. The room includes instruments and stands in the middle of the room. I use the Suzuki method books. I am a classical player and I teach classical music. My son had his first lesson with Angela and already she is helping him along. She is very easy going and positive. Her studio room is positively too cool as well! First lesson left me with a very good impression. Can't wait to go back. Angela is amazing! She is very patient, flexible and pushes you to excel beyond expectations. I am so excited to take cello lessons from such a talented, intelligent, honest and fun music instructor! I am trained a trained music educator from csuf and I have over 5 years of individual teaching experience. I specialize in catering my approach to each students specific needs and learning style. Hello and welcome to my profile! My name is Patrick and I look forward to working with you soon. I have been working with students of all age ranges, learning styles, and ambitions for over 5 years and I specialize in individualizing my teaching approach based on YOUR specific needs and desires. My ultimate goal as a teacher is to change peoples lives profoundly through music. I am a classically trained musician who has studied at CSUF and performs Classical, Jazz, Popular, Musical theater, and Opera. I have performed in venues like the Hollywood Bowl, Segerstrom hall, Walt Disney concert hall and many more with artists like Andrea Bocelli, Josh Groban, John Williams, the LA philharmonic orchestra, and the Pacific Symphony, among others. We are so thankful we found Patrick! Patrick is a very effective teacher who’s able to relate and motivate students. Our daughter was loosing interest in playing piano due to her former teacher’s approach. Now she’s back to practicing because she wants to and is so excited to see Patrick each week. We are very greatful that she’s back to loving piano and continuing to learn. Patrick is a great teacher, and very patient. I've never learned how to sing or read music before, and he teaches at a pace that's good for me. I highly recommend him whether you're an adult or you're considering enrolling your child. Patrick is friendly and very knowledgeable. I want to provide students with the opportunity to do and achieve anything they desire with music and become well-rounded musicians. My goal is to enable students to make music independently and become self-sufficient learners. As a result, students can enjoy music for their own playing and/or choose to become professional musicians. I have over 20 years of experience in teaching viola and violin students of all ages and levels. And I have knowledge of Piano and Music Theory as well. I have been a member of MTAC (Music Teachers’ Association of California) since 2005, and I currently serve as string chair as well as first vice president of South Coast Branch - MTAC. I am also a member of SYMF (Southwestern Youth Music Festival), so I enter many talented students pursuing music into the CM (Certificate of Merit) test, violin or viola competitions and auditions every year. rformed as a principal violist with Seoul National Symphony Orchestra, Orange County Chamber Ensemble, and Southern California Chamber Orchestra. She has also appeared as guest principal violist with Los Angeles Korean Philharmonic Orchestra and California Central Philharmonic Orchestra. In September of 2002, Anna performed for the Concert called “Synergy” with Los Angeles Philharmonic directed by Esa-Pekka Salonen. In addition to being an active performer, Ms K. has established herself as an educator. Since 1992, she has been teaching students, and has served for 7 years as the string instructor of Amateur Orchestra at Seoul Women’s University in Korea. Besides her teaching career, she has served as chair of “Contemporary Flare Festival” from 2010 to 2012 and the SWV (Strings/Winds/Voice) Competition from 2012 to 2015 in South Coast Branch, MTAC (Music Teachers’ Association of California). Currently, she serves as string chair as well as vice president of South Coast Branch, MTAC (Music Teachers’ Association of California). Anna K. received her Master’s degree in music from University of Southern California (USC) . She has studied with Haeyoung Baik, Seongryong Choi, Chan-Ju Wee, Pamela Goldsmith, and Donald McInnes. My 12 year-old son has attended Anna's violin lessons since Sep. 2018. He likes going to her studio, enjoys the sessions, and improves his skills. Anna seems be experiencing in teaching. She keeps my son be interested while learning new skills. I'm glad I found her as a violin teacher for my son. Highly recommend. My 6-yr-old daughter started taking violin lessons with Ms. Anna a couple months ago. She really enjoys learning from Ms. Anna and is making lots of progress in such a shory time! Anna is very knowledgeable, experienced and has confidence in her teaching. We strongly recommend her! As an instrumentalist and composer, I have the privilege of an active and successful career in Music, performing across the country with world-class artists, as well as writing music for some of the most sought after international performers. I believe Music is, most importantly, a tool for communication. As a teacher, I strive to show students how to use this tool on their path towards clearer, more confident self-expression, and in so doing, further myself along the same path. I believe Music is, most importantly, a tool for communication. As a teacher, my goal is to show students how to use this tool on their path towards clearer, more confident self-expression, and in so doing, further myself along the same path. As an instrumentalist and composer, I have the privilege of an active and successful career in Music, performing across the country as well as internationally with world-class artists, and writing music for some of the most sought after performers in the country. Very informative, positive, and patient teacher. Kristapor is a wonderful teacher. He not only taught my son violin, but also inspired him to be a better violinist. He spent hours with my son to come up with a high standard audition tape for applying a summer music camp. My son got accepted & had a great time learning music at the camp. Thank you, Kristapor!!!! I took violin lessons from Kris for nearly two years, until moving out of LA. He is an extremely talented musician and teacher. During these lessons, my violin technique and musical expression both considerably improved. Kris is very patient, and able to teach multiple methods to successfully master various violin techniques (such as vibrato). Through implementing improvisation into the lessons, Kris can also bring out the student's musical creativity and confidence, which not only helps aspiring composers, but guides violin students in adding expression to the music they're currently learning. He encourages students to challenge themselves, but effectively teaches all of the techniques necessary to accomplish their musical goals. He is also a brilliant composer, and is an excellent composition teacher as well! Although my lessons were mostly focused on violin, he provided much useful advice for improving my compositions for orchestra and symphonic band as well. I highly recommend Kris as an instructor for music students of any proficiency level! In teaching lessons, it is my great pleasure to share with students of all ages and skill levels the knowledge that I've gained over 23 years of playing. I firmly believe that anyone can learn anything at any time, given the proper tools! In our first lesson, we will determine your musical goals and create a realistic path to achieving them. It's my job to help you along this path while keeping things fun. To maintain focus and week-to-week continuity, I always provide lesson notes to take home. I can also provide recordings of lessons and transcriptions of pieces, if desired. At 5 years old I was struck by the incredible beauty of Vivaldi's music, and ever since I've been playing violin. I hold a BA from Oberlin College of Arts and Sciences, won a scholarship to the Baroque Performance Institute in 2005 and attended the BPI again in 2006. Apart from teaching, as a professional musician performing in Southern California I am well versed both in classical violin and various fiddle styles ranging from bluegrass, Celtic and old-time to rock, pop and blues. I also play viola and mandolin and write music. A fun and informative lesson. Looking forward to the next one. Elias is great! My daughter is 7 and this was her first exposure to violin lessons. She loves Elias, says how patient and nice he is, and can’t wait for her next lesson each week. I highly recommend him! Hi! I’m Hana, a student at Lakeside School. Music is my passion, and I have been playing the violin for over 13 years. I have studied under teachers including Jan Coleman (Coleman Studio) and Professor Ron Patterson (University of Washington). I am concertmaster of my school orchestra and also play in the Seattle Youth Symphony. I also won first place for solo violin at my regional division of WMEA Solo and Ensemble. I believe that a good technical foundation is essential to advance your playing, so as a teacher I will ensure that my students have all of the tools necessary to produce a beautiful sound. I also strongly believe that effective practicing is vital to advancement on the violin, so another one of my priorities is teaching my students how to practice. Additionally, I recognize that all my students have very different goals, and I always to tailor lessons to suit their individual objectives. Hi! I’m Hana. Music is my passion, and I have been playing the violin for over 14 years. I have studied under teachers including Jan Coleman (Coleman Studio) and Professor Ron Patterson (University of Washington). I have been teaching violin in various ways since 2013, and my experience includes teaching private students, giving private lessons as a volunteer with Seattle Music Partners, and coaching various young string ensembles. I was concertmaster of my high school orchestra and played in the Seattle Youth Symphony. I also won first place for solo violin at my regional division of WMEA Solo and Ensemble. Now, I am continuing my studies of the violin at Scripps College. ecessary to produce a beautiful sound. I also strongly believe that effective practicing is vital to advancement on the violin, so another one of my priorities is teaching my students how to practice efficiently. Additionally, I recognize that all my students have very different goals, and I always to tailor lessons to suit their individual objectives. Most of all, as a teacher I want to foster in my students a love of the violin and of music. Music adds so much joy and meaning to my life, and helps me connect with amazing people. Through teaching, I hope to share this amazing opportunity with others. My son has really been enjoying lessons with Hana. His grades in orchestra have dramatically improved. Hana also carries herself with great maturity for her age and I highly recommend her as a teacher for children. Does your student love music and want to learn to play the violin? I can help them. My professional career encompasses more than 35 years of elementary level music instruction. I have successfully launched hundreds of students into a growing love of music and a working knowledge of the fundamentals of music and instrumental technique. Learning music should be fun. I will develop a curriculum that matches desires, your child's desires, goals and individual learning style. And we will have fun along the way. Contact me today to get your child started on the road to musical success. I have been serving the young people of my community for the last 36+ years as an elementary school music teacher. I graduated from Cal State University Fullerton with a BA in Music Education and a K-12 teaching credential in music. I have taught a wide range of music classes including general music, choir, piano, orchestra and band. My classroom experience includes early childhood (K-5th grade), english learners and special needs students. I enjoy working with students who have had limited musical knowledge or experience. I love bringing them to a level of proficiency where they can be confident performers on their chosen instrument. Some of my students have continued their music education through college and others have brought their love of music into their careers as adults. ividuals. So I tailor and fit my music instruction to the unique aptitudes and needs of each child. I want to communicate the fun of creating music as well as the technical aspects of playing an instrument. You can expect your student to gain a solid foundation in the fundamentals of music and instrumental technique. I offer private instruction for students who wish to learn the trombone or the violin. I also advise and assist parents in choosing a serviceable instrument for their student to rent or own. This has been a real help to several parents and families over the years. Contact me for more information. I’d love to be of help. Mr. Gary has been teaching our son trombone for a few months now and we have been delighted with his teaching. Mr. Gary is very patient with our son, and has ignited a real love of the instrument and given our son confidence. He never gets short and is always calm and encouraging, even when our son is not into it at all. He teaches the fundamentals of breath, playing musically and how to take care of the instrument. Mr. Gary is always encouraging and positive, and that helps to encourage a love for the music and instrument. Our son has definitely taken to the trombone and a lot of that is due to Mr. Gary's great teaching. Can't find a teacher in Corona, CA? Students are raving about their Violin instructors on TakeLessons. Check out some of these recent reviews. "Great teacher! Very patient and has great knowledge of music." San Bernardino, CA teacher: Chen C.
talented with teaching young children. I was impressed to see how much my daughter learned in only 45 minutes. When it was over my daughter said, "That was so much fun!". My daughter is looking forward to her next lesson." San Bernardino, CA teacher: Rui M.
fun and easy to learn and is always so encouraging. You really can't go wrong with Rui as your teacher." "Chris made the lesson a lot of fun for my 7 year old daughter. He's the 3rd instructor we have tried and is by far the best!" San Bernardino, CA teacher: Chris S.
"In a scale of 1 through 10, and 10 being the highest, I give her a perfect 10." "Chris brings a great attitude to every lesson and sometimes I even catch my son having a great time!" way and become something more with these lessons." "Rui is a very good teacher! Nothing but positive feedback to my daughter. Rui was very patient." Whether you're just starting out or a seasoned pro, check out the Violin articles on our blog.